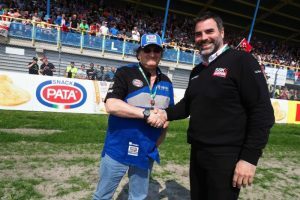 A fan favorite in the historical town of Imola, Pata and Dorna WSBK Organization are delighted to announce Pata will be the title sponsor of the Italian Round of the series, which takes place from 11th – 13th May. With the first Italian round of the season just over a week away, anticipation is building for what will be a stunning weekend in front of the passionate fans. Basking in the Emilia-Romagna sunshine, the historical 4.9km circuit is preparing for a sensational WorldSBK weekend, full of pure Italian passion. Providing Italy with innovative and unique snacks for now 37 years, Pata’s level of passion and progression personifies the essence of the high levels of racing and passion we see in WorldSBK.